A key characteristic of Mixed-Integer (MI) problems is the presence of both continuous and discrete problem variables. These variables can interact in various ways, resulting in challenging optimization problems. In this paper, we study the design of an algorithm that combines the strengths of LTGA and iAMaLGaM: state-of-the-art model-building EAs designed for discrete and continuous search spaces, respectively. We examine and discuss issues which emerge when trying to integrate those two algorithms into the MI setting. Our considerations lead to a design of a new algorithm for solving MI problems, which we motivate and compare with alternative approaches. Sadowski, K.L, Thierens, D, & Bosman, P.A.N. (2014). 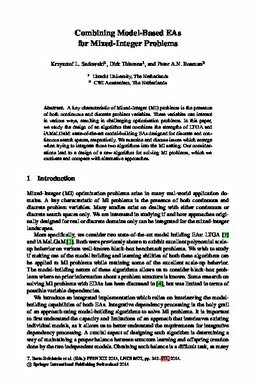 Combining model-based EAs for Mixed-Integer problems. In Proceedings of International Conference on Parallel Problem Solving from Nature 2014 (pp. 342–351). Springer.